The 37th annual Burton US Open Snowboarding Championships, set for Feb. 27 through March 2 in Vail, announced its free concert lineup on Monday, with acts ranging from Greensky Bluegrass to Turkuaz to Tune-Yards to Khruangbin and a slew of top-shelf DJs. BURLINGTON, VT (February 11, 2019) –The 37th annual Burton U·S·OPEN Snowboarding Championships are rolling out another incredible Burton Concert Series lineup featuring four nights of free entertainment in Vail, Colorado. This year’s roster of live bands and DJs includes Tune-Yards, Greensky Bluegrass, Khruangbin, Turkuaz and more! The Burton Concert Series runs from Wednesday, Feb. 27th through Saturday, March 2nd in the heart of Colorado’s Vail Village. These free live performances will take place at the Solaris outdoor concert stage following each day’s snowboard competition, at the late-night Shakedown Sessions Presented by Jack Daniels at Shakedown Bar and at the Dobson Ice arena closing party. •Greensky Bluegrass formed in 2000 in Kalamazoo, Michigan. Much like Mumford & Sons and the Avett Brothers, Greensky Bluegrass are heralded for bringing bluegrass to a whole new generation. •Tune-Yards are an eclectic, experimental band that has earned accolades from The New York Times and top billing from the Village Voice. They’ve collaborated with the likes of Yoko Ono and David Byrne, and are currently touring for their fourth album. 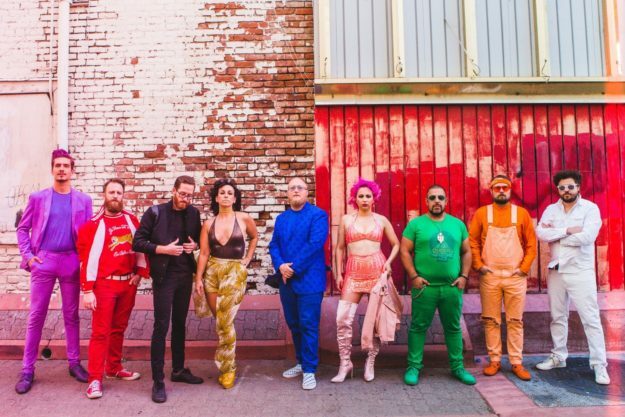 •Brooklyn-based Turkuaz are a nine-person band that has performed at festivals from Bonnaroo to Telluride Jazz, gracing stages from Terminal 5 to The Fillmore. The band is known for igniting an explosion of energy, deft musicality and show-stopping sing-alongs. •Khruangbin are an American musical trio from Burton, Texas. The band is known for blending global music influences with a psychedelic twist. •The closing party at Dobson Ice Arena on Saturday night will be a sonic punch of DJs, featuring Red Bull 3Style World Champions ESKEI83 and DJ BYTE, plus Burlington, Vermont’s own DJ CRE8.